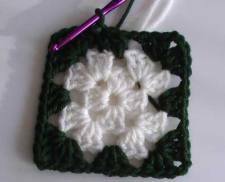 A Granny Square is one of the easiest crochet projects you can do if you are just starting out. If you have a little experience then this won't take you long at all. After you master the Granny Square, you will want to make the red heart as well. The most difficult part of learning is; you have to learn how to hold the hook and the yarn at the same time and keep the yarn loose and even while you go. But, don't worry! You will get it if you keep trying! Remember to subscribe to all of our craft and crochet videos, it's free and you will be notified when we have a new one! Make a slip Knot and Chain 6 . Watch Video Here if needed, it's sometimes easier to follow along if you can actually see someone doing it. 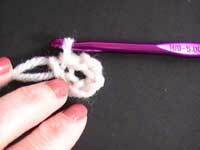 Form a slip knot around the hook, wrap y arn around the hook, and pull it through the loop in the knot. 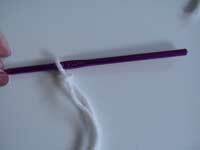 The yarn you pulled through is wrapped around the hook, and you can pull another loop through. Be sure to leave 2 inches of extra yarn at the beginning (tail). 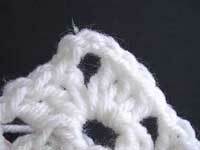 Slip stitch into first chain (to form a ring). Pull a new loop through the loop th at's already on the hook, as well as through the chain stitch. Chain three (equivalent of a first stitch of double). Make three dc into the center of the ring. Chain two. Make three double crochet into the center of the ring. Chain two. Repeat two more times, for a total of 4 groups of 3 dc (double crochet). Finished first row. Slip stitch into the top of the three chain to finish the round. New Color Add a new color for the next row if you like... 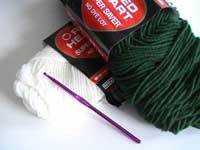 Simply start crocheting with the new color. Begin the second row by chaining three (an equivalent of a first double crochet). 3 dc in hole or "corner". In the "corner," one of the spaces created by the chain two between sets of double, do 3 double, chain two, and three more double. This begins to create the square. Note: Double bunches of three dc in each "corner". Chain two to the next corner, and repeat. 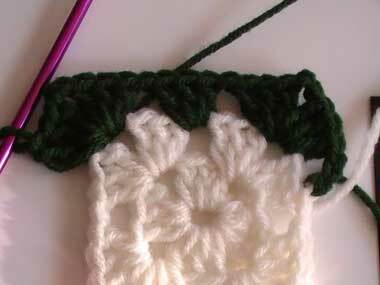 Do all 4 corners, and then slip stitch to the first corner to finish the round. Each corner should have two sets of three dc, each separated by two chain stitches. Start row 3 with color brought up behind from row one. Change colors again if you like. Completed row three. Note two bunches in corners, single bunches along the straight sides. Double crochet TWO bunches of three (separated by two chain stitches) into each corner... But only ONE bunch of three dc into each "flat side" hole from here on out. Now, you have completed a Granny Square, how about trying a crochet red heart?